NEW YORK (AP) -- Hackers calling themselves Guardians of Peace made ominous threats Tuesday against movie theatres showing Sony Pictures' film "The Interview'' that referenced the terrorist attacks of September 11, 2001. The group also released a trove of data files: what they called the beginning of a "Christmas gift.'' 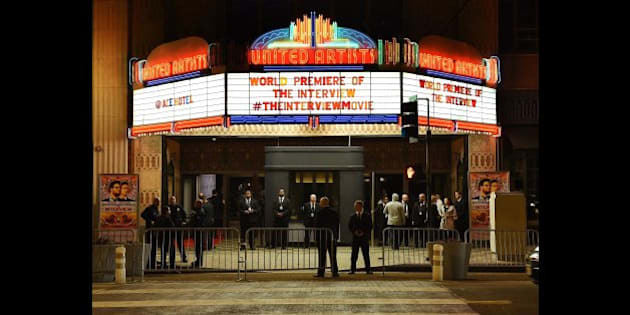 But GOP, as the group is known, included a message warning that people should stay away from places where "The Interview'' will be shown, including the upcoming premiere. Referencing 9-11, it urged people to leave their homes if located near theatres showing the film. "The Interview'' is a comedy in which Seth Rogen and James Franco star as television journalists involved in a CIA plot to assassinate North Korean leader Kim Jong Un. Its New York premiere is scheduled for Thursday at Manhattan's Landmark Sunshine, and is expected to hit theatres nationwide on Christmas Day. It premiered in Los Angeles last week. In a statement, the FBI said it is aware of the threats and ``continues to work collaboratively with our partners to investigate this matter.'' It declined to comment on whether North Korea or another country was behind the attack. Speculation about a North Korean link to the Sony hacking has centred on that country's angry denunciation of the film. Over the summer, North Korea warned that the film's release would be an "act of war that we will never tolerate.'' It said the U.S. will face "merciless'' retaliation. Patrick Corcoran, spokesman for the National Association of Theater Owners, wouldn't comment on the threats. For the latest data dump, the hackers are using disposable email addresses provided by a French-based service called yopmail.com. Frenchman Frederic Leroy, who started up the yopmail site in 2004, was surprised to learn the Sony hackers were using yopmail addresses. He said there was no way he could identify the users. "I cannot see the identities of people using the address ... there is no name, no first name,'' he said in a phone interview with The Associated Press. He said yopmail is used around the world but there are ``hundreds and hundreds'' of other disposable email sites. Leroy, who lives in Barr, outside Strasbourg in eastern France, said he heard about the Sony hackers yesterday on the radio but knows nothing more. He said he has not been contacted by any authorities. Separately Tuesday, two former employees of Sony Pictures Entertainment sued the Culver City, California company for not preventing hackers from stealing nearly 50,000 social security numbers, salary details and other personal information from current and former workers. The federal suit alleges that emails and other information leaked by the hackers show that Sony's information-technology department and its top lawyer believed its security system was vulnerable to attack, but that company did not act on those warnings. Associated Press writers Eric Tucker in Washington, Lindsey Bahr in Los Angeles, Jack Coyle in New York and Elaine Ganley in Paris contributed to this report.